It is amazing how just putting the emphasis on a different syllable can almost turn a normal common word to you into a foreign language…just try saying "em-PHAS-is on a different sill-LAB-ill" to see what I mean. Case in point, I just attended a fruit and nut conference that had attendees from across North America. In a setting like this, you quickly realize that some fun can be had just learning all the different common names and how they are pronounced. Take the tasty pecan (Carya illinoinensis). I think I heard it pronounced at least 6 different ways…all of them regionally correct for the person speaking; pah-CON, puh-CAN, PEE-can, PEE-con, pee-CON, and pee-CAN. This line of discussion naturally leads to others, like how to pronounce peony, Lirope or maybe even Clematis. Some plants have a ridiculous number of common names. 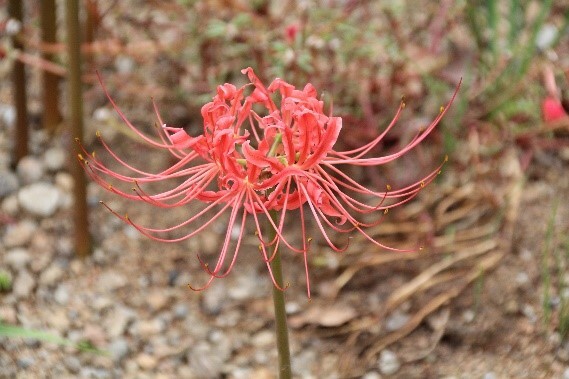 Take for example a plant in bloom now, the cold hardy Lycoris squamigera (summer-blooming bulb; zone 5-9). 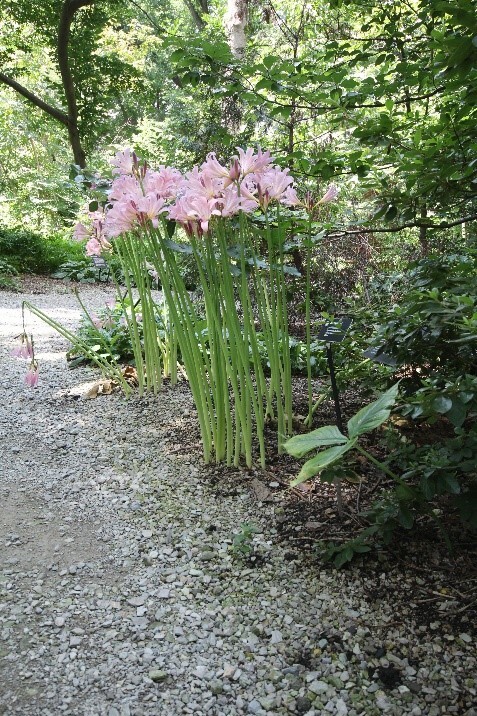 It is commonly referred to as magic lilies, surprise lilies, resurrection lilies; hardy amaryllis, naked ladies (or nekked ladies) and pink ladies, just to name a few. Many of the names seem to stem from the plant's growth habit of waiting to send up an unbranched flower stalk until after all evidence of its spring emerged amaryllis-like leaves have completely senesced…Surprise!...I'm not done yet! Though not native to the US, they are so widespread that many have given them assumed naturalized citizenship status much like the ditch lily (Hemerocallis fulva). Spider lily is another common name that is attributed to species and their cultivars with exceptionally long stamens resembling spider legs, hence the common name. But through it all, the scientific name allows gardeners to discuss plants using their local common names while still maintaining a universal translation. How else would I get away with calling a green pepper a mango as I did growing up without qualifying that I was referring to a Capsicum species rather than Mangifera indica. By the way, referring to a green pepper by the name "mango" seems to be unique to pockets in Indiana, Ohio and Pennsylvania. Cornelian cherry dogwood (Cornus mas) fruit harvest tends to coincides with the appearance of magic lily bloom in my jungle. If you have never seen or eaten the fruit, I would describe then as looking like an elongated cherry, pit and all. The texture and flavor is very cherry-like, though sour. Like a cherry, they are sweeter and better flavored if harvested at full ripeness. 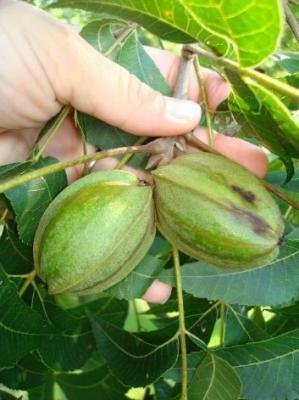 They will drop from the tree when fully ripe and there is competition with wildlife for a share of the harvest. 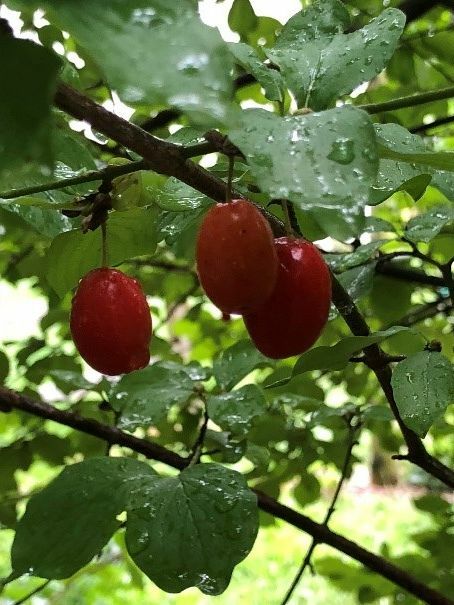 Pictured here are fruit from an unimproved species type, though a number of named selections with improved fruit quality are available in the nursery trade. 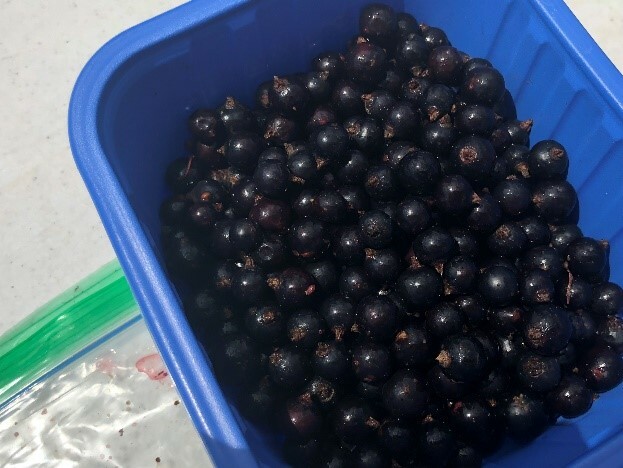 I recently had the opportunity to tour some University of Illinois black currant research at the Champaign fruit research farm, including a taste test of five cultivars harvested from a larger cultivar trial. Compared to 'Consort,' which most agree rates fairly low in flavor, the four additional cultivars were excellent, including Blackcomb, Tsema, Chime and Tenah. I may just have to give black currant another go in my jungle, assuming these tastier cultivars have white pine blister rust resistance and I can source the plant material. Ahh, another challenge that I am fully up for.